A selection of anime characters ported by me from MMD, as commissions. I added and edited many things, and also had to translate the skeletons, materials and flexes from Japanese, which means there may be errors, which you can feel free to report here or on Tumblr, and I'm sure I'll fix them someday. Or not. Eyeposing via bones, with a dummy bone that you can use as viewtarget using aim constraints. Contains a separate Blush and Mouth model, they might come useful. Sakura's hair had to be a separate model because it has too many bones. Just lock her head bone to the hair's head or root bone and then apply the zero preset on the hair's head bone. Then have fun posing that hair. You can use Aim Constraints on the eyes and Eye_Target bones to make a viewtarget. 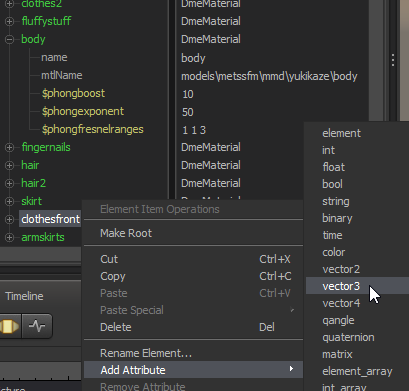 If you can't properly control the surface reflectivity of a material with $phongboost and $phongexponent, try using vector3 $phongfresnelranges! Here's some quick help on what I mean. Looks like I left an empty lightwarp on that material, Ill look into it tonight as I get home, thanks. how do you install the mod in the game for naked models? Sept. 17, 2015, 1:41 p.m.